Fourth Row Center: Film Writings by Jason Bailey: On DVD: "Parenthood: The Complete First Season"
On DVD: "Parenthood: The Complete First Season"
For several weeks after its premiere in March of 2010, the (admittedly first-rate) TV and film blog Movieline would run a weekly recap of the series Parenthood, and they'd give it the business. With titles like "A laundry list of edgy family situations tackled on last night's Parenthood" or "Monica Potter's 'O face,' and 4 other edgy family issues tackled on last night's Parenthood," writer Julie Miller would take apart the conflict-and-drama-heavy series, following its most convoluted situations ("Your Asperger-diagnosed nephew finds your bong while you are child-proofing the house for the biracial son you just found out you had") with pithy rejoinders ("Who hasn't this happened to?"). On the face of it, Miller makes a point. Parenthood can be a bit overstuffed--there are something like 15 major characters--and yes, it slams quite a few Important Topics (infidelity, teen sexuality, drug use, May-December romance, interracial parenting, separation, Asperger's syndrome, sibling rivalry, private school competition, marital temptation, the high school rumor mill, working mothers, and--God help us--the real estate bubble) into its 13 first season episodes. But somehow, the show's gifted writers, directors, and cast keep the show from sinking under the heavy weight of its own ambition. It's quite the juggling act, really. The show is based, of course, on Ron Howard's 1989 movie, which NBC already attempted to turn into a weekly series a full 20 years previous (that time as a half-hour "dramedy", back when those were all the rage). For reasons unknown--perhaps to keep from being a remake of that show?--all of the names are changed (the Buckmans have become the Bravermans), though the equivalent characters are clear. The show centers primarily on the four Braverman siblings, though patriarch Zeek (Craig T. Nelson) and matriarch Camille (Bonnie Bedelia) are major players as well. 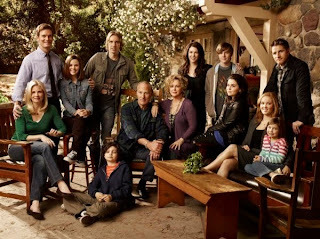 Adam (Peter Krause) is the responsible head of the nuclear family, though he and wife Kristina (Monica Potter) find themselves in a little over their heads with their son Max (Max Burkholder), who is diagnosed with Asperger's. Footloose Crosby (Dax Shepard) is finally thinking about settling down with a long-term(ish) girlfriend when an old flame (Joy Bryant) reappears with a five-year-old son he never knew existed. Julia (Erika Christensen), the sole breadwinner for her home, is finding it harder to be a present mother, and to keep the other mothers away from her stay-at-home husband (Sam Jaeger). But the inciting event of the series is the return of Sarah (Lauren Graham), the unlucky-in-love single mom who moves herself and her two kids back in with Zeek and Camille so she can get her life together. The combination of her drama and the shift in the dynamics throughout the rest of the family make for a fairly combustible mix. The show doesn't start as strongly as it ends; it takes series creator Jason Katims (Friday Night Lights) and the writing staff some time to find the show's particular voice, the degree to which the high drama and throwaway comedy should mix. You can also see, over those first few episodes, the large ensemble cast finding each other's wavelengths, getting in tune with their characters and how they relate to each other. As a result, when you go back to them, there's a slight stiffness to those early episodes--we're not yet seeing the easy, loose interplay that makes so many of the sibling scenes so strong later in the run, or the comfort and ease of Krause and Potter's relationship. But that's just performers finding their footing, and the show is beautifully cast. Reliable old Peter Krause isn't stretching much here (he tends to excel at playing the calm guy in the center of the storm), but he's grounded and believable, particularly in the late season arc in which he finds himself trapped in a fight between his wife and his sister. If Krause does (albeit well) exactly what we expect, the surprise of the series is Shepard, who is sensitive and engaging; who knew there was a real actor lurking inside the co-star of When in Rome and Employee of the Month? The commitment-phobe who grows up is a device that has long passed its expiration date, but Shepard brings real pathos to the role. Christensen's role is probably the least compelling of the quartet, but she does some interesting things; as her husband, Jaeger wisely plays the background and quietly captures exactly what it's like to be on the edge of a tight family. Graham, though, is in many ways the heart of the show. A last-minute replacement for Maura Tierney, who dropped out of the series due to illness, her single-mom-of-teens role would seem to place her in imminent danger of recycling Lorelei Gimore--and indeed, one of the show's more poorly chosen storylines is an aborted romance between her and one of her daughter's teachers, an arc presumably written before Graham was on board but nonetheless distractingly familiar. But, superficial similarities nowithstanding, Graham gets to play some new beats here, and she plays them impeccably; on Gilmore Girls, she was the mother of a (sometimes credibility-stretching) perfect kid, while her character here is facing the challenges of raising a truly troubled teen. Mae Whitman might not seem the like the first choice to play the sexed-up bad girl--she's best known as Ann "Her?" Veal on Arrested Development--but she shows astonishing range and skill, as well as a remarkable vocal resemblance to her TV mom (listen closely during her big fight with Haddie, and you'd swear they looped in Graham's voice). Their last-episode fight and reconciliation are among the season's best moments; likewise Graham's job interview earlier in the year, in which she lays bare a vulnerability seldom seen (with such truth, anyway) on the small screen. Parenthood may push a little too hard, what with the heavy subject matter, the constant turmoil, the frequent and less-than-subtle tear-jerking. But whatever charges you can lob against it, you can't say that it doesn't work. It's a smoothly-made, moving, heartfelt, funny show--soapy in places, sure, but potent and likable nonetheless. "Parenthood: The Complete First Season" was released today on DVD. For full A/V details, read this review on DVD Talk. Saturday Night at the Movies: "Tell No One"
On DVD: "Bill Maher- But I'm Not Wrong"
New on Blu: "In Cold Blood"
In Theaters: "My Dog Tulip"